Helmut Spahn (left), head of security for the Germany FA, and Mohammed Hanzab, president of the International Centre for Sport Security. 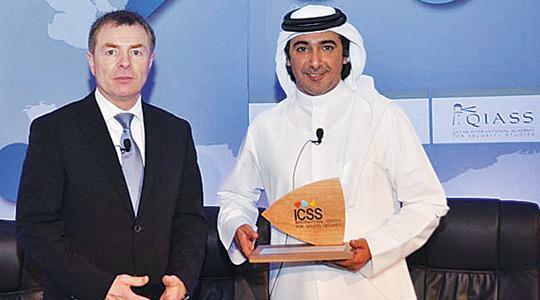 The first International Sports Security Conference took place in Doha, Qatar, earlier this month. Malta FA CEO Bjorn Vassallo and Ivan Vella, the national teams’ manager, were among the 150 delegates who attended this high-level conference. The conference was hailed as a great success, given the high-level of responsibility and expertise of the participants. The majority of the attendees occupy key positions in international sports institutions, law enforcement agencies, government/public sector, and private security companies. Ronald Noble, the general secretary of Interpol, was among the experts who took part in this conference. An interesting debate during the two-day conference discussed a series of key topics. Emphasis was laid on the need of co-operation across agencies, sports, and geographies, the importance of international institutions and agencies that may act as a liaison between experts and the need for a relentless fight against integrity breaches (e.g. doping, illegal gambling, match fixing). “This was a very positive, informative experience for us,” Vassallo told The Sunday Times. “Primarily, this conference focused on security in sports and the management of sporting events, but other important topics like illegal gambling and match-fixing were also raised. “I’m the first to admit that in Malta, we are lagging in this field,” Vassallo added. “For example, we still have to draw up an adequate traffic management system in the National Stadium area. “In our country, you only see police officers overlook security at sports venues, but in other countries, this work is carried out by trained stewards. “The entry practices at sporting facilities are still primitive as tickets are normally bought at the gate whereas in most countries, there’s a system of online ticketing and bar codes to quicken and facilitate the process. “To this end, the MFA is working to implement a traffic management plan and ticketing system at Ta’ Qali. “We clearly have a long way to go, especially after listening to what experts from FIFA, UEFA and IOC had to say about this subject but we’re committed to raising the standards to ensure a positive and safe experience for the football fans. During the first day of the conference, Mohammed Hanzab, president of the Qatar International Academy for Security Studies (QIASS), announced the creation of the International Centre of Sports Security (ICSS) to the conference delegates. The ICSS will be a non-for-profit institution in the world of sports and security, whose mission is “to enhance security and safety in the world of sport, by proactively addressing real issues, and providing best-in-class training, research, and tailored consulting in sport security”. Hanzab remarked that the March 9-10 conference opened the discussion on the work awaiting Qatar to successfully stage the 2022 World Cup. The QIASS president said his country is also willing to listen to everyone to ensure that Doha becomes a centre of excellence and that the 2022 World Cup will be a success in every aspect.